When I first started to become intersted in catfish, the sailfin plec or gibby (which still doesn't seem to be a widespread term) was still only available as 2-3" wild caught specimens at around £10 upwards. These fish were often different in pattern and colour ranging from nice to spectacular. Every now and again an adult fish would appear for sale at 12" plus with a huge dorsal fin and directly proportional price tag. In my view, the only down-side of commercial breeding is that you don't get the odd-balls and regional colour variations that appear in shipments of wild caught fish. When looking at Sailfin Plecs in the shops, they all look the same now. Mind you, I still look just in case! There is now the almost monthly influx of other new plecs to the hobby, so suckermouth fans remain well catered for. On the subject of unusual imports, there is also an albino strain of this fish which is hard to acquire. Progress has given us commercially bred Sailfin Plecs and these can be found on a visit to most aquatic shops most of the time. You should be able to find an adult (which has usually been returned upon outgrowing its owner's provision for it) without much difficulty. Commercial breeding has dropped the price and made this fish readily available at an affordable price for all aquarists. The cloud of this particular silver lining is that this has led to the fish being sold cheaply at the 1-2" mark which invariably means more people will buy them unaware of the 18" gentle monster they are now responsible for. Growing gibbiceps shouldn't be a problem for most 3ft or larger aquariums as most shops will happily swap a well-fed healthy 8" gibby for a scrawny 1-2" juvenile. The dealer gets a nice fish to sell; the aquarist gets the fun of raising another of these fish. Most importantly the plecos get moved to tanks suited to their size. As an aside to this someone setting up, for example, a mid-sized cichlid tank will have a ready made supply of suitably sized algae eaters/worker catfish to buy "off the shelf". Excepting raising cichlids and plecos from youngsters together, it is easiest to add adult plecs to big fish tanks than throw in a few youngsters with adult fish and hope for the best. Finally an advert. I once put a 6" gibby in a 4'x2'x2' that could only be described as green. In 48 hours the tank, the rocks, the bogwood and even the individual pieces of gravel were spotless! The only problems were enormous amount of 'processed' algae from the back end of the gibby and what to feed it next. It now demolishes a cucumber per fortnight along with sinking catfish tablets. I ended up adding an external power filter just to look after the huge quantities of green waste (no pun intended!) these fish produce. Etymology Greek, pterygion, diminutive of pteryx = wing, fin + Greek, hoplon = weapon + Greek, ichthys = fish. This specific epithet refers to the hump (gibbus=hump) on its head (kephale=head). 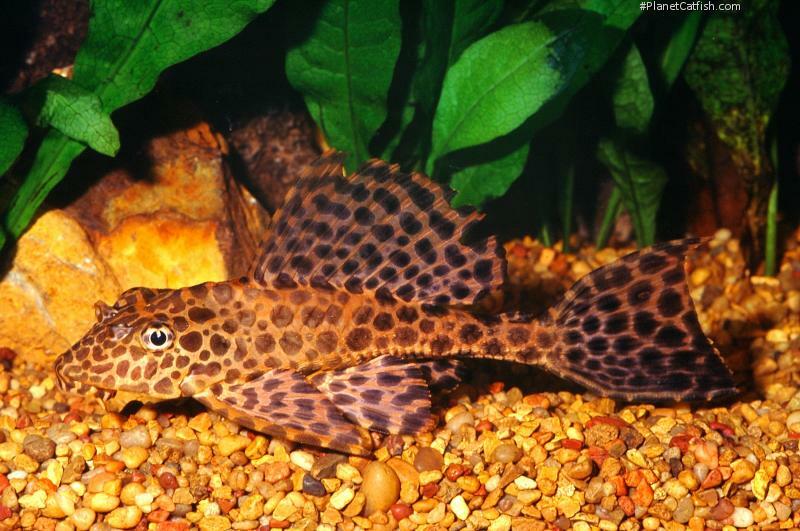 The trademark spotted sailfin makes this a distinctive species. Distribution Widespread throughout the Peruvian & Brazilian Amazon. Also known from the Rio Orinoco. Other Parameters Larger fish require heavy filtration, not because they are fussy about water quality, but because of the high volumes of waste they produce. Compatibility Larger individuals are territorial to conspecifics however not predatory and able to look after itself with all but the most violent tank mates. Suggested Tankmates Hardy and stoic, a good companion fish for most larger fishes. Not a good pleco to keep with other similarly sized, less gregarious plecos as the P. gibbiceps will usually win any competition for food. There are 331 registered keepers, view all "my cats" data.